by Calvin D. Trowbridge, Jr. In 1610, fewer than 1,000 Europeans lived in North America above Mexico. In 1640, that number had increased to 30,000. Learn what happened in those three deadly decades! The indigenous North Americans above Mexico had successfully held off repeated European efforts to invade, settle, and hold territory for over a century. In 1610, Europeans had settlements only around Quebec City, St. Augustine, and Santa Fe. But thirty years later, Europeans controlled much of the Atlantic Ocean seaboard and central New Mexico, and European-style governments had been created in Canada and the United States. Thousands of indigenous Americans had died in warfare. Tens of thousands had died of disease, and epidemic after epidemic debilitated and depopulated villages, chiefdoms, and nations. 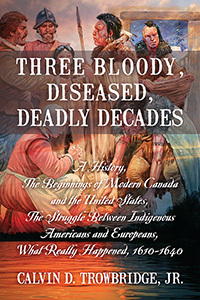 Three Bloody, Diseased, Deadly Decades is the first book to focus on the fascinating history of this 30-year period marking the beginning of modern Canada and the United States. Calvin D. Trowbridge, Jr. is the author of Marconi, Father of Wireless, Grandfather of Radio, Great-grandfather of the Cell Phone: The Race to Control Long-Distance Wireless. A graduate of Phillips Exeter Academy, Yale University, and Harvard Law School, Trowbridge was a corporate partner of Isham, Lincoln & Beale, and senior vice president, general counsel, and secretary of Norton Simon, whose subsidiaries included Avis and Canada Dry. He is currently managing director of Trowbridge International Consultants.